Views from the loch. : A real mess! Photo 01 - Massive erosion on Kirkstead, fence shows original route! 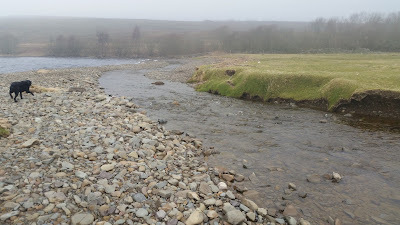 We have known about this for some time but viewing the devastation on the Kirkstead burn that has taken place during the flood events was put off until today. As this blog records the social history of the club it is vitally important we record the events that shape our future actions. As everyone will know the amounts of water visited upon us earlier was without precedent and caused massive damage! 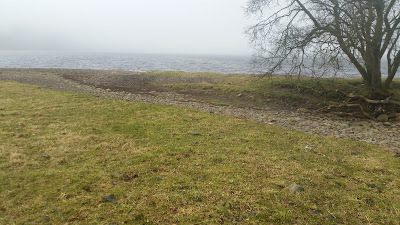 What appears to have taken place is that the Kirkstead was full and a raging torrent whilst St Mary’s was swollen to bursting point and the force of St Mary’s loch pushed the water of the Kirkstead back forcing it to create a new path where the resistance was much lower hence a new route for the burn was gouged out! 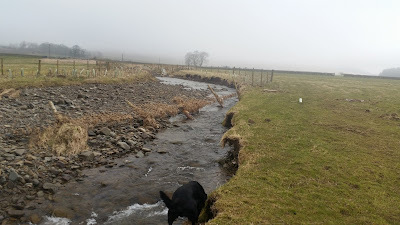 Huge amounts of erosion have taken place and needless to say our natural bank reinforcement work was washed away with ease! 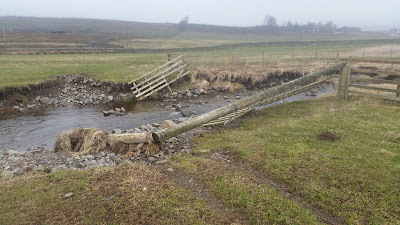 In addition to this the work of the Tweed Forum in carrying out the fencing work has seen the fence mostly destroyed with sections left dangling in the air and the gates disappear without trace! Its a blow for us and them and we shall meet with them to see what the way forward may be. 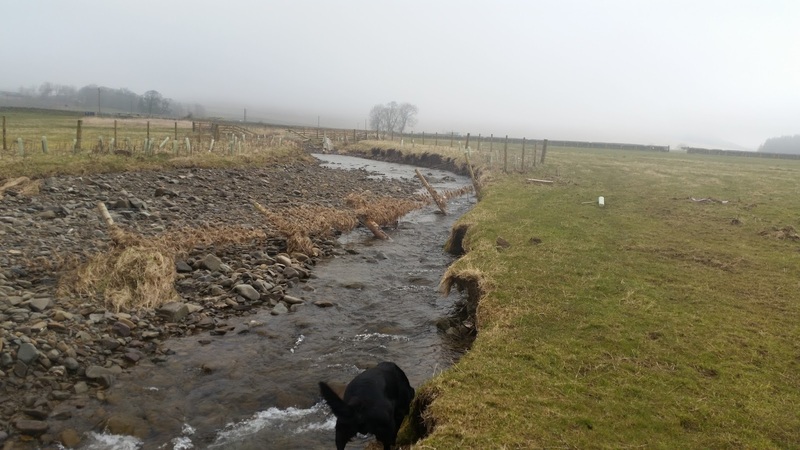 Surprisingly many of our trees in the upper areas survived the onslaught of water although they are no longer lining the banks of the burn simply standing on farmland in many cases a good way from the new route taken by the burn. Once stock get in they will be wiped out! It is clear to me at least that to have a set route for the burn would involve heavy engineering works which as a club is beyond our reach. Burns do change course over time it’s a well known fact, but the problem at Kirkstead is that farm land is being replaced by rubble! 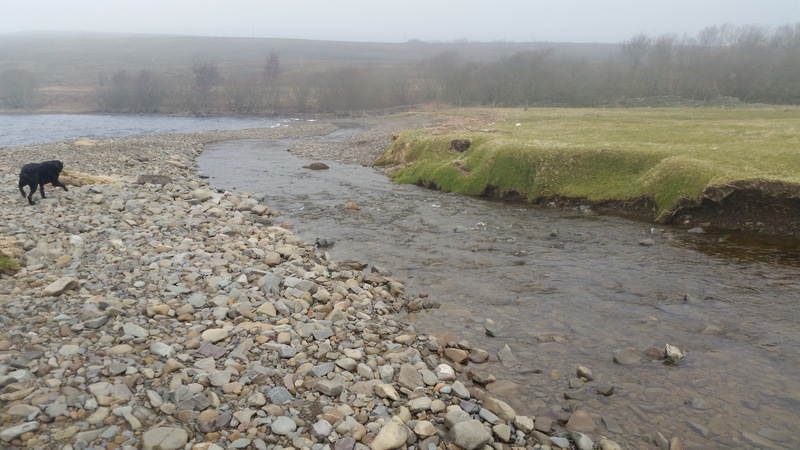 The problem for us is that relentless change robs our young fish of much food as the new channel will take a few years to become a good food producing area! The current route being taken by Kirkstead is a temporary one and the bottom end at least will change quickly. This area has pushed through shingle adjacent to the loch and an angry St Mary’s or Kirkstead will re route the burn in quick time! I think the fencing could be realigned to the contours of the burn but we have to ask ourselves if this would be a productive move! Unless we can guarantee a steady long term route for the burn the same thing could happen again. I will be asking the Selkirk Flood Protection group to what extent they think they are responsible for the chaos caused! There can be no doubt an artificial set of circumstances has been engineered here and the effects of this will only become apparent with time! I believe that here we have witnessed a natural event, but an event that has seen the negative consequences exacerbated by the flood protection works! 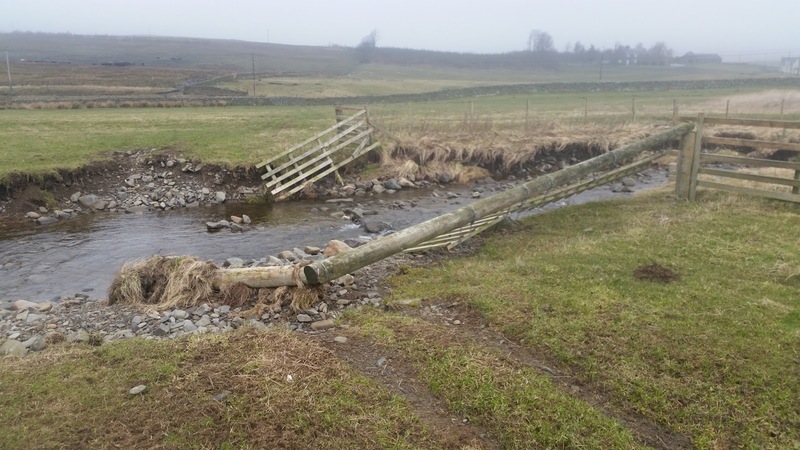 The Kirkstead burn is crucial for us as an angling club as it is by far our most productive spawning burn and any detriment to the burn will affect us on the loch a few years down the line! We have some talking to do and we must come up with an action plan to counteract what is a real mess! Photo 02 - Stock gates demolished! Note - both fields were completely empty of stock, no dog leashed or unleashed should be allowed in any field containing stock! At long last it’s in sight, the official start to the Brown Trout season in Scotland! If you haven’t got your gear ready then you had better get cracking. I won’t make opening day due to work but I would be very surprised if a few of our regulars are not out sinking flies braving whatever conditions Mother Nature throws our way! According to the elder statesmen of the club floating line should be your first choice with a couple of traditional like March Brown, Greenwells Glory Woodcock & mixed and an attractor like Zulu or the famed orange goldhead! If they are not doing the business try an intermediate line to get further down. Finally if all else fails its sinking line and get right down. Of course dry fly aficionados could always try a floater you just never know. The start of a potentially glorious 6 months is nigh get those flies in the water! Whatever your meat we wish all our anglers Tight Lines! Photo 03 - Redundant, the old route taken by Kirkstead! Photo 04 - A temporary exit constructed with shingle! It was nowhere to be seen in the Tory manifesto yet out of the blue came a scheme to extend opening hours for shops in England! Yes these buffoons though it would be fine to increase the working hours of some of the most poorly people in the land! Shop workers do not normally get paid premium rates, they work unsocial hours for the normal hourly rate unlike many other groups of workers. These out of touch posh boys got it seriously wrong but had it not been for the SNP the despicable bill would have passed! Yes the "Omnishambles" crowd got it badly wrong yet again! Fair play to the SNP delving into a mostly English measure to protect the workers involved! At last these Tory fools are being seen for the idiots they are. Their nuclear plan for Hinckley is about to fall apart which would be a very good thing. Did you ever hear of allowing a nuclear facility to be run by a foreign power and built by another foreign power! Again it was always coming Barack Obama let rip as to what he really thinks about Lord Snooty telling us what we already know! Yes he said Libya after the Franco-British intervention was an absolute disaster! Blair’s cross was weapons of mass destruction whilst Snooty’s cross was intervention to prevent a mass genocide, another fictional fairy story! Five years after the ill judged farce there is still no evidence of any actual or any intended genocide! Like Blair, Lord Snooty was desperate to get in there and show them the might of the British Empire, instead he yet again embarrassed the people of this country and has created a situation resulting in thousands of deaths! I find it sickening that before Lord Snooty invaded Libya there existed a society enjoying a standard of living never before experienced. Gaddafi was no angel but he kept order and people were safe, Libya is now a hell hole thanks to Lord Snooty! Prepare for another embarrassing defeat for the Tories as the House of Lords look set to vote down the further punishing cuts to the weak and disabled. Yes these devoid of compassion Tories look set to push ahead with cuts to the already derisory amounts given to these people. The worst thing however is Minister without a clue Gideon Osborne wants to use this money to fund tax cuts for the top 15% earners in the country! He is also very busy laying down excuses for the coming downturn so that when the "recovery" crashes he can pass on the blame! What an absolute farce, this is not a government rather just a group of jumped up posh boys who do not have a care in the world! Yes that is the greatest affliction the country has, we are being hobbled by an inept group of fools who are still trying (and failing) to recover the country from the 2008 banking crash! We started out with the Con-Dems who were ultra successful in embarrassing the whole country with their outlandish policy! The situation has not changed and we are still being shown up by these Tory fools as they blunder from one failed policy to the next! Many people were surprised by the rock solid support for the SNP I think now it will be abundantly clear why this is the case. The choice for the people of Scotland is clear, more buffoonery and gaffe's from the Tories or simple thought out policy from the SNP!